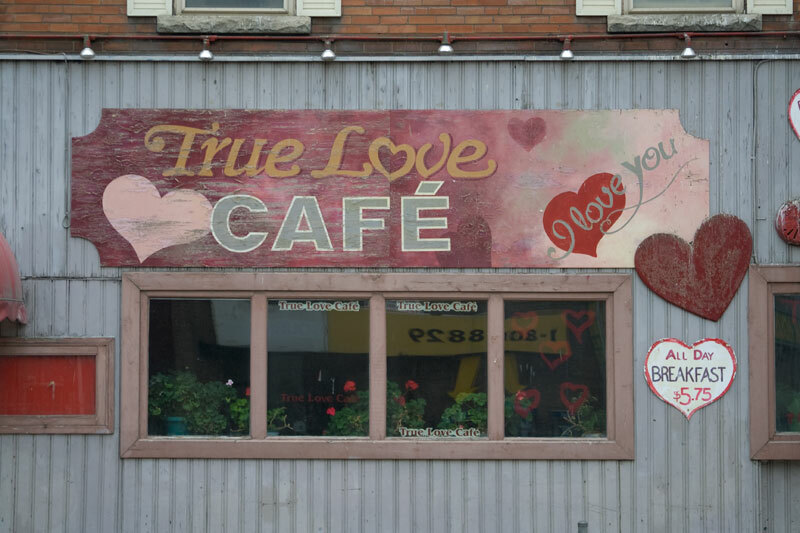 On Valentine’s Day I made a special pilgrimage to True Love Café and snapped some pictures. It’s located in Toronto’s most violent neighbourhood, right at the intersection of Dundas and Sherbourne. The facade is plastered with hearts, but these are neglected hearts, bruised hearts, hearts that have seen better days. It’s disconcerting to see a dilapidated monument to love in a part of town known for robberies and vicious assaults. When I visited on Monday, the café was dark inside. I don’t know if it’s a currently functioning business. Hope Valentine’s Day left your heart in better condition than what we encounter at this sad street corner. This entry was posted on February 16, 2010 at 5:29 pm and is filed under Damage. You can follow any responses to this entry through the RSS 2.0 feed. You can leave a response, or trackback from your own site. Thanks for your comment. Signs like this one definitely make the city more interesting! I would love to hear from someone who has eaten here. I wonder if it’s a place people choose to go while out on a date.